With the Hauptplatz, the medieval old town’s main square at its heart, Austria’s second-largest city and its most relaxed, Graz, the capital city of the southern Austrian province of Styria, is an instant heart-stealer, with abundant parkland, red rooftops and a narrow but fast-flowing river loudly gushing through its center. A very beautiful bluff – connected to the center by steps, shops and restaurants line the narrow surrounding streets, which blend Renaissance and baroque architecture. A funicular leading up to Schlossberg, the town hill, to the Uhrturm, a centuries-old clock tower. Across the River Mur, futuristic Kunsthaus Graz exhibits contemporary art. With a notable number of students in Graz, there’s a youthful energy here too, with a handful of edgily modern buildings, a vibrant arts scene and upbeat, student-fueled nightlife. This extends to both sides of the Mur, although the Lend district, across from the historic center, skews young and edgy. 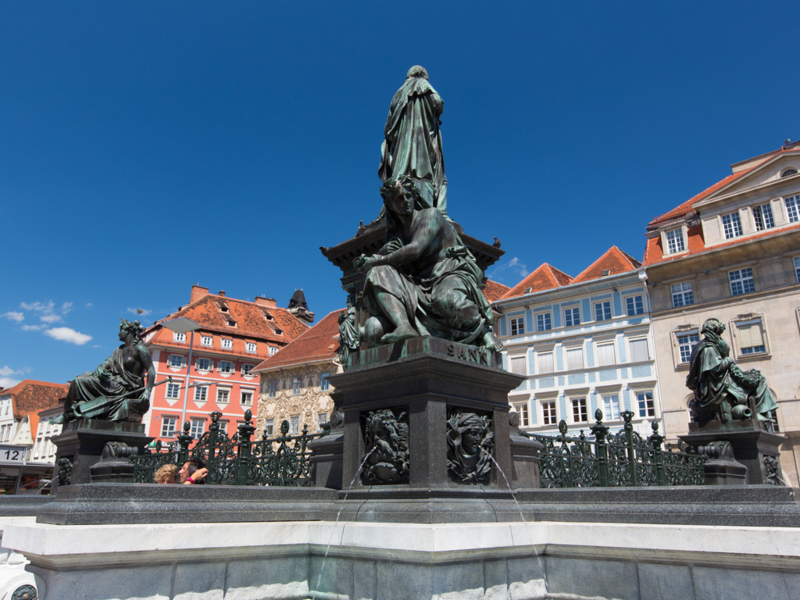 Graz is well known for its historic military past, and fittingly the city’s name comes from the Slovenian word “Gradec,” which means “small castle.” This old town is in fact on the site of the Roman fort that was built in the 1st century to defend the northern frontier. After the fall of the Empire, the Slovenian peoples settled this area, building a small castle near the site of the Roman fort. The city, and the nearby fortress, came under the rule of the Habsburg dynasty in the 13th century during the reign of King Rudolph I, and has been part of Austria ever since.